Amy did quite a bit of work relevant to the effects of purine nucleotides on competence. 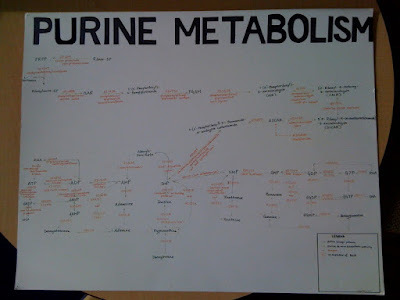 The most immediately useful has been a big poster she drew, showing all the components (genes, enzymes, intermediates of purine metabolism in H. influenzae (bases, nucleosides and nucleotides, and both de novo synthesis and salvage pathways. I've just stuck it up on the corkboard outside my office, for handy reference. Most of her time was spent constructing a fusion of lacZ to a control gene, surE, which is expressed in competent cultures but not regulated by PurR, and her very last experiment was to put her surE::lacZ fusion plasmid into H. influenzae and freeze the strains. We might use this plasmid as a control for effects of purine supplementation on general gene expression. She also did a lot of tests of the effects of nucleotide, nucleoside and base supplementation. She repeated our experiments with nucleotides, finding that adding either 5 mM AMP and GMP to MIV reduced transformation more than 1000-fold, and that CMP and UMP had no effect. In one experiment AMP reduced cfu/ml by about 5-fold but in another it had no effect. She then checked effects on transcription, using lacZ fusions to comA, rec2 and sxy. With both AMP and GMP this showed about 10-fold reductions for rec2, 5-fold reductions for comA, and very little effect on sxy. CMP and UMP caused only less than 2-fold reductions. She used cells in sBHI as a control; all fusions were much lower than in any MIV treatment. She also tested the effects of purine bases on transcription; hypoxanthine and guanine had little or no effect (confirming our previous transformation assays), but inosine reduced comA and rec2 transcription by about 5-fold and 8-fold respectively. Inosine hadn't been previously tested by us, but decades earlier it had been reported to inhibit competence development in MIV (Miller and Huang 1970). The effects on AMP and GMP were smaller than we had previously reported, so she modified her protocol a bit (putting filtered cells directly into the supplemented MIV), and saw larger effects (for comA: >20-fold for AMP and ~10-fold for GMP). Some of her first experiments tested whether nucleotide supplementation of sBHI affected cell growth. At 5 mM, all four nucleotides slowed growth dramatically; AMP halted it. (Adenine toxicity has been previously studied, in old E. coli experiments.) 1 mM nucleotides were much less toxic. The effect is unlikely to be due to unbalanced pools, as supplementing with all four nucleotides at 1 mM each caused similar growth inhibition to the single nucleotides. Thank you for such an awesome blog post. It is nice to see my results summarized so well. 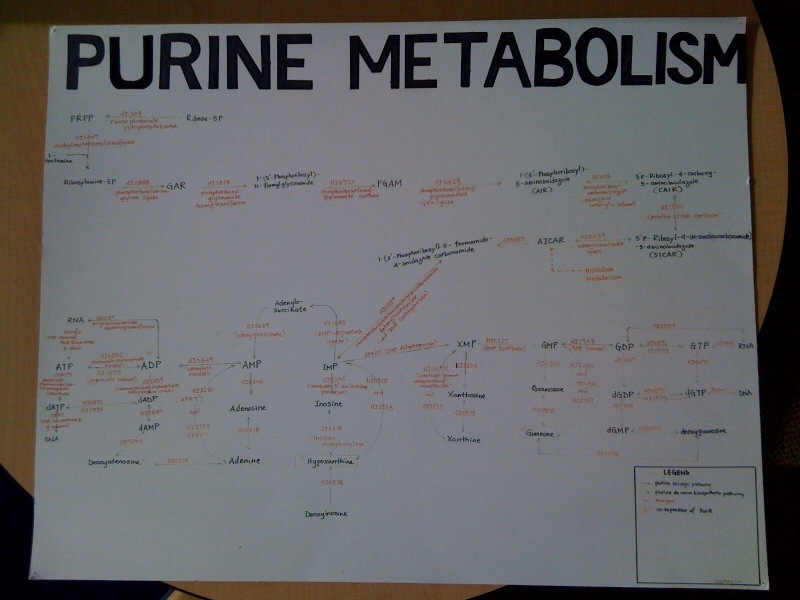 I can't believe you still have that purine metabolism poster (and I would love to have a picture of it). I really enjoyed working in your lab and this blog post brought back many fond memories. By the way, I am now working with David Guttman and Darrell Desveaux on host-pathogen interaction. Actually, I am in the same lab as Heather and it was Heather who showed me the blog! I hope everything is well with you!